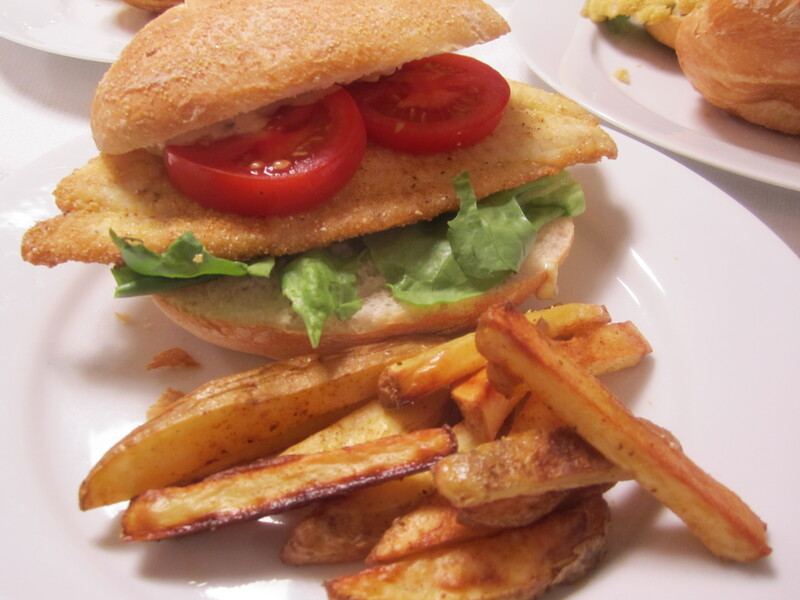 After a perfect day at the beach, sometimes all I want is a crispy fried fish sandwich–American style. Flounder is local in Eastern Long Island and it’s sweet and delicate. Because the filets are generally thin, they’re very prone to overcooking. That’s why some sort of coating is a good idea–either bread crumbs or cornmeal. I find cornmeal works great as a simple coating for fish. I add a bit of flour (about one part flour to two parts cornmeal) so that the coating adheres well to the fish. Simply heat about a quarter cup of olive oil on highest heat in a broad nonstick skillet. 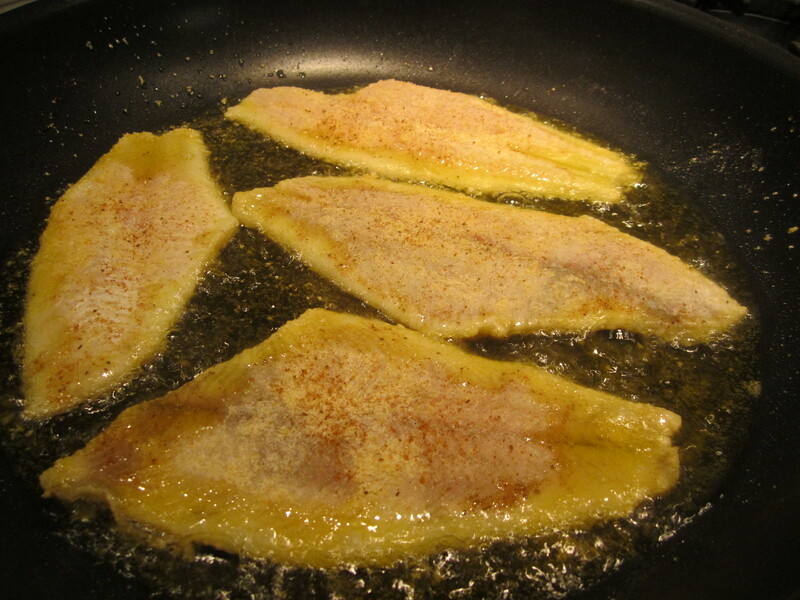 Dredge fish in cornmeal/flour and gently slide fish into hot oil. Do not crowd the pan (do in batches, if necessary.) Season with salt and/or some “Old Bay” seasoning (for that seafood house flavor). The filets only need a minute-and-a-half or so on each side. Be careful when turning and use a large spatula or two–they break easily. As part of my sandwich meal, I always love some french fries–in this case, oven fries. Fairly thin and crispy, they will eliminate the need to ever deep fry potatoes again. If you eat these fries straight from the oven, they have a crispness and toastiness that rivals deep fried potatoes. But they must be eaten immediately or they lose crispness–much like deep fried potatoes. For the fries, heat oven to 425 degrees (use convection, if you have it). Slice potatoes into 1/2″ thick julienne (with skins on) and place on baking tray. Drizzle liberally with olive oil and sprinkle with salt–toss together with fingers. Don’t crowd the baking tray–use 2 trays to keep some space for air to circulate around potatoes and make them crispy. Bake for about 40 minutes, or until deeply golden and crispy. Salt well and eat immediately. Above all, a well executed read. Might be this blog’s greatest piece to date..